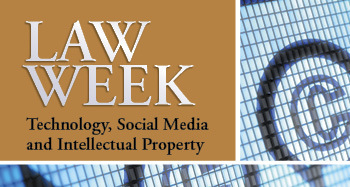 This Law Week 2013 chapter focuses on how technology and intellectual property law affects a variety of industries, and the latest on social media and the law. View other Law Week 2013 topics here. Manti Teo is an accomplished football player. The former linebacker for the University of Notre Dame was a 2012 runner-up for the prestigious Heisman Trophy. Growing up in Hawaii, he was one of the most decorated high school athletes in the state’s history. Locked away in digital data stored on desktop, tablet and laptop computers, mobile phones, flash drives and computer networks are the missing pieces to civil and criminal cases. Digital evidence is as vital to investigators as any physical evidence roped off by yellow crime-scene tape. Twenty-eight years ago, Claudette Wilson was an anomaly. NEW YORK — Facebook says that an independent audit found its privacy practices sufficient during a six-month assessment period that followed a settlement with federal regulators. WASHINGTON — The Supreme Court seemed worried on April 15 about the idea of companies patenting human genes in a case that could profoundly reshape the multibillion-dollar biomedical industry and U.S. research in the fight against diseases like breast and ovarian cancer. Pfizer Inc. CEO Ian Read said April 25 that continuing expirations of drug patents through 2015 will restrain revenue growth, but the world's largest drugmaker is trying to offset that with launches of several medicines and research to create new ones. NEW YORK — Painter and photographer Richard Prince, whose works have sold for millions of dollars, did not violate copyrights with most of the paintings and collages he based on a photographer's published works, a federal appeals court ruled April 25 in a case closely watched within the art community. Members of the legal community, much like the rest of society, have embraced the use of social media, anxious to take advantage of its immediacy, connectivity and treasure trove of information. County court systems have a reputation for archaic filing systems, but San Diego County is squashing that stereotype. Obviousness-type double patenting (ODP) is a judicially created doctrine that prohibits extending a right of exclusivity to subject matter claimed in a later issuing patent if an earlier patent claims subject matter that is not patentably distinct. Nature abhors a vacuum. So, too does the challenging field of e-Discovery, where data sources are growing in number and complexity in inverse proportion to storage costs. The phenomenon has some litigants grappling with the astronomical costs associated with mining mountains of electronically stored information (ESI) to find what they need. Filling that vacuum is a nascent methodology called technology-assisted review that has the potential to modernize document review processes and significantly reduce associated costs. Immigration attorney Jacob Sapochnick has a lot of empathy for his clients. He was, after all, in their position not too many years ago. When people hear the term forensic psychiatry, most assume the job involves bloody crime scenes and dead bodies — but not quite. Whether they're startups or well-established corporations, biotech firms strive to create products that protect our health and well-being. But those products — ranging from stents and biochips to surgical tools and instrumentation — often need protection themselves in the form of patent and trademark rights. With a focus on doing work with San Diego businesses, Pettit Kohn Ingrassia & Lutz PC, a growing law firm with expertise in litigating and resolving civil matters in both state and federal courts, operates under the belief that legal counsel should act as a partner, not a vendor. From his office overlooking the Broadway corridor, John Klinedinst has a direct bead on State Street, where he opened his first office as a solo practitioner in 1983. From April 29 to May 3, The Daily Transcript honors Law Week with a weeklong series celebrating the business of law. Coverage includes stories on important issues like civil rights, real estate and construction, intellectual property, and legal education. This Law Week 2013 chapter highlights education and legal services. Law Week 2013 continues with a look at the latest real estate and construction legal issues.